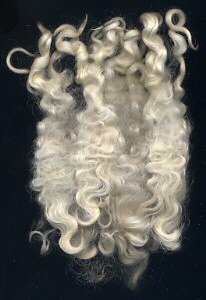 I have finished spinning my first handful of Leicester Longwool; about as much as I need for enough yarn for one sheep motif on my Rare Breed Sweater. The total weight I worked with was 54 grams (1.8 ounces). From that I was able to comb 34 grams (1.2 ounces), from which I spun a worsted yarn. From the remaining 20 grams, I picked out about 4 grams (0.1 ounce) of neps and second cuts. 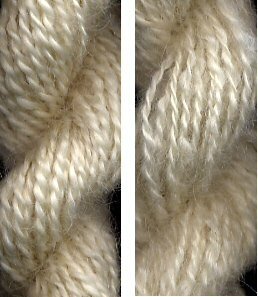 I handcarded the remaining 16 grams (½ ounce) for a woolen yarn sample. So, percentage-wise, that handful yielded 63% worsted, 30% woolen, and 7% waste. Here they are, with the worsted yarn on the left. I used my Kromski Minstrel for both yarns, spinning with the 8.5 ratio whorl. Both measure 14 WPI. Neither one has a soft hand. 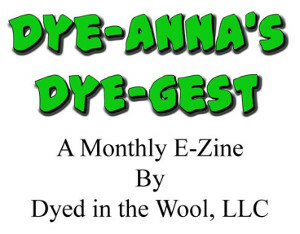 The worsted yarn is smoother and has I love its luster, though it is not as silky to touch as Wensleydale. It was lovely to spin however. I tend to spin short fibers more often than long ones, so I had to keep reminding myself of its 6 inch length and adjust my hand positioning accordingly. Still, it was so easy to spin that I developed a rhythm quickly. The woolen yarn still has some rare neps and short bits in it. The fiber length was anywhere from 1 to 3 inches. I don't think this style of spinning does the fiber justice, but it is nice to know I will be able to utilize most of the fleece. .....that I'm thinking someday I'd like to experiment and try some in a woven fleece sample. And the best news is that this is the last of my rare breed yarn samples for my sweater. So it's soon time to start swatching. I have lots of ideas, I only hope that some of them are workable. Too often the picture in my head doesn't match the results on my needles! :o The weather is finally turning cooler, so sweater knitting will be a welcome activity. Gorgeous as usual. Boy you really have a gift for spinning beautiful yarn! I can't wait to see your rare breeds sweater in action. I have a collection of yarn - no telling what trail I will follow you down next. What beautiful yarn - your rare breed sweater is going to be incredible! they are beautiful Leigh! Oh how I wish I knew how to spin! Thanks for stopping in and visiting, Leigh, and for your kind words. Don't spin, myself, but it is on my list as the final piece in the triad of spinning, dyeing, weaving. Am wanting to pick up a workshop at some point in the next year. Right now, my goal for this year is a major focus on double weave, double width. I love focusing on one technique and really exploring it in depth. I really enjoy your blog, and will come back to visit often. Those locks are so beautiful and shiney. The handspun from them is also very beautiful. You do such a nice job.